Microsoft Innovative Teacher, software designer, scientist and digital technology expert Michael Fenton shares ideas to support students, parents and teachers engage with the new Digital Technologies curriculum. Michael has a limited number of complete robots built at cost, first in first served! 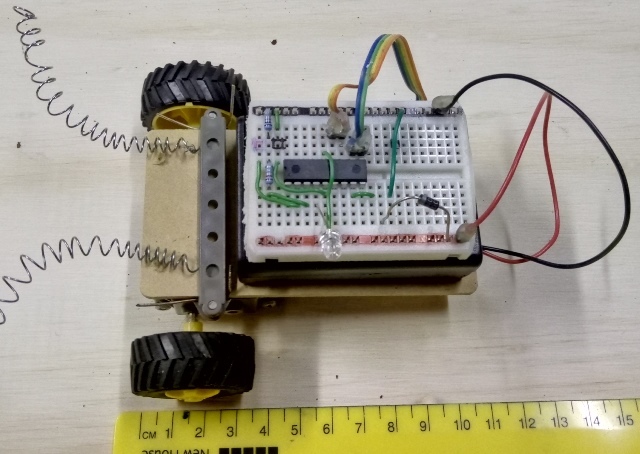 On this page, building a robot for the Sumo battle or Maze solving competitions. 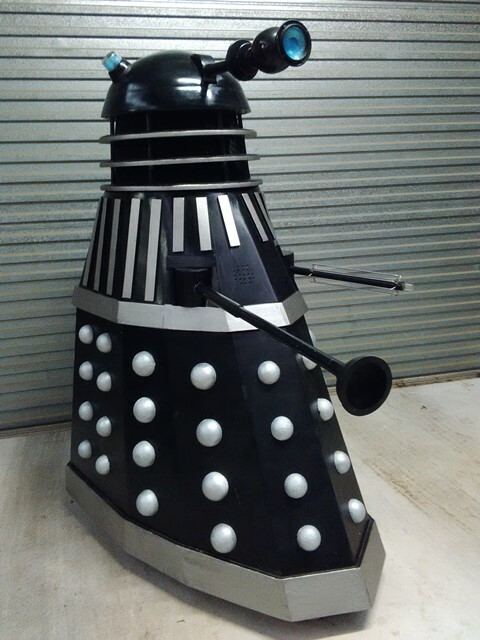 Read the news feature or visit the Nexus Robotics page to build BIG robots like a Dalek from Dr Who! 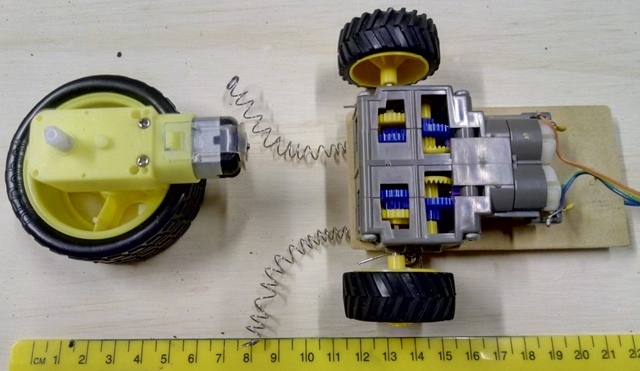 MiniBots: shall not be larger, either in length or in width, than 10 centimetres. Mass (with batteries) 500 grams maximum. MegaBots: shall not be larger, either in length or in width, than 20 centimetres. Mass (with batteries) 3 kg. maximum. All robots need to be checked in at the La Mer Lounge at a date and time to be confirmed for 2019. No more than 2 students in a group entry to attend on the day. The new Lost in Space series on Netflix is the inspiration for a "Rescue the Robinsons" maze competition. This entry involves a scratch-built robot, the purchase of a kit to assemble, or the purchase of a ready-made pre-assembled robot. The robot MUST be autonomous...self-contained with NO remote control permitted. YOUR MISSION: The Robinson family is lost in space, stranded on a strange new planet after their spaceship, the Jupiter 2, has crash-landed. Two of the children, Will and Penny Robinson, have gone out to survey the crash site, but have not returned. The robots that navigate the maze to find the Robinsons in the best time will win monetary prizes. The maze will be based on line following; a black line on a white background, with branches and dead-ends. You can make your own maze using black electrical tape stuck to boards or a floor. Sumo robot competitions have been prevalent in Japan, with the first competition being held in 1989 with only 33 robots, by 2001, the number was over 4,000. 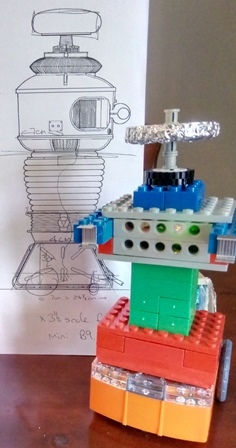 This entry involves a scratch-built robot, as seen here on the right, or the purchase of a kit to assemble, or the purchase of a ready-made pre-assembled robot. YOUR MISSION: Sumo-bot wrestling requires robots to push or flip each other out of a circular ring (dohyo). A robot that is flipped & immobilized or pushed outside of the dohyo loses, the other robot wins a yuko point. The first to gain two yuko points wins the match. 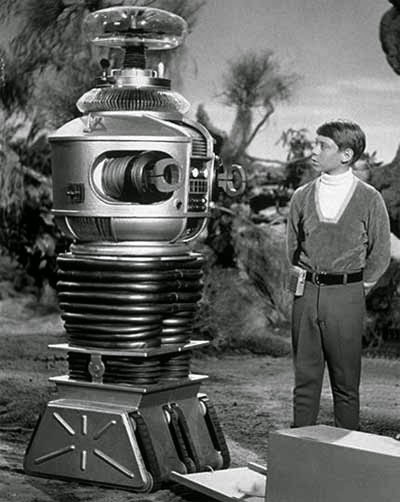 Robots may be remote controlled (r/c) OR autonomous (self-contained, no remote controls). R/c robots battle other r/c robots; autonomous robots battle other autonomous robots. The robot will start a battle when a button on its body is pressed to begin movement after a 5 second delay. Entrants will battle the robots on the day of the fair, and the robots with the best performance will win monetary prizes. Tim Carr from Mindkits.co.nz kindly supplied two of these amazing robots, real value-for-money and intuitive to use. First of all, I hate looking at naked robots. C3P0 looked creepy without his metal skin, and the T800 Terminator endoskeleton gives me nightmares still. Robots should be "dressed" or be designed with a type of "costume" in mind. Making and designing are creative acts so why not make a functional machine that also looks interesting or inspiring? How can you make your robot look more interesting with a body modification or costume covering? You could use card or other materials but keep in mind the Edison sensors still need to do their jobs! You could research some famous robots for ideas to make Edison a body to be proud of! Works straight out of the box, (once batteries inserted); no programming needed to see results! Can be programmed by bar codes provided, for immediate obstacle avoidance, sumo, etc. EdBlocks programming interface simple to use for beginners - no language to learn! 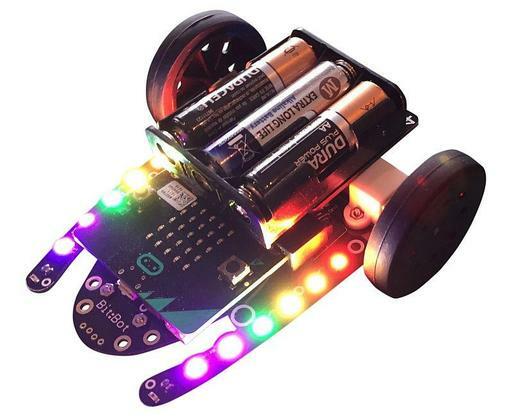 A great robot for under $70 that works on any device (Apple, Windows, smartphone), grows with the user from novice to expert and is very well constructed and robust. In the video above you will see I added a PICAXE 08M2 chip to flash the lights in the chest cavity. 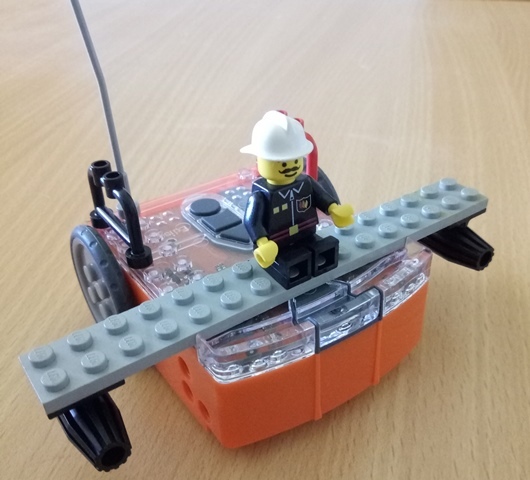 For experts or advanced builders: It is possible to add a range of different sensors, such as temperature or colour sensors, to the PICAXE chip and then programme the PICAXE to send an IR signal to Edison. Edison can be programmed to move in response to the IR signal. This opens the Edison up to a much wider set of environmental conditions to monitor, moving in response to the external sensors attached to the PICAXE. You could have a heat-seeking Edison! Using an old clock body and a PICAXE chip programmed in BASIC, I made the Jupiter 2 spaceship from Lost in Space. This prop will be at the centre of the maze. The Jupiter 2 is paired with my smart phone using the free Keuwlsoft Bluetooth Controller app and has 8 LEDs (4 pairs), 1 MP3 player module, and 1 Bluetooth module. Very cheap to make, very easy to wire up, and simple to code. Here again it adds a lot of appeal to have a fully "dressed" robot. Rather than letting people see the bare circuitry and gears, why not make a body costume to make your robot look more interesting and appealing? 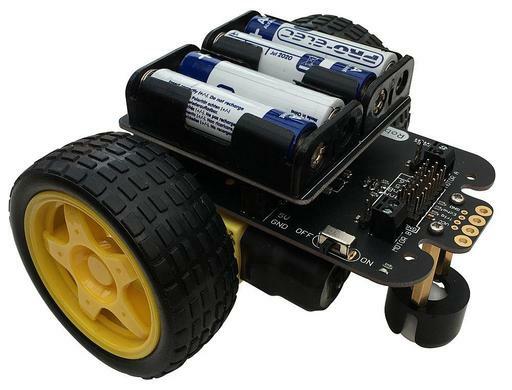 OP1 is a PICAXE-based robot with a L239D motor controller and a Bluetooth module. He operates on 8 C-size cells (12 volts DC). OP1 senses the environment for temperatue and static electricity, sending the data back to my smartphone for graphing. I can also take control of OP1 to drive the robot remotely. 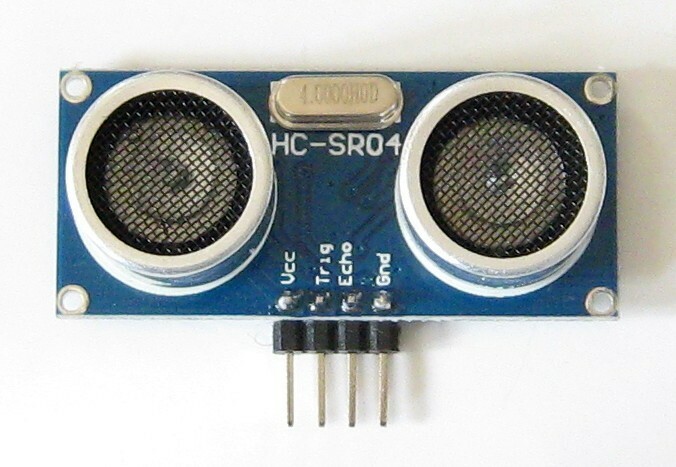 There is a MP3 player module to produce sound effects. On the front is an ultrasonic range finder module, an aid to avoiding obstacles when OP1 autonomously explores his surroundings. Suppliers of kits and parts; There are a number of suppliers of PICAXE and Arduino kits and parts. Try Mindkits or Jaycar or Surplustronics. 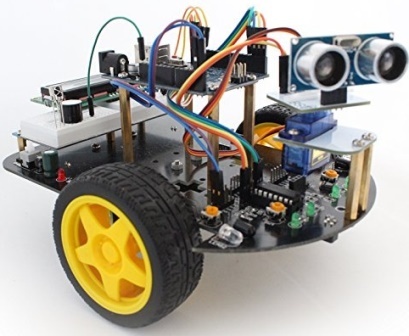 I have recently seen Arduino Smart Car kits at www.dx.com who also provide motor controllers, bluetooth modules, ultrasonic range finders, etc, often with free delivery. I have found them very reliable, but some parts take a few weeks to arrive, depending on availablility. The Arduino Smart Car kit is a great dea from DX.com. AND you can substitute easily a simpler breadboard with a PICAXE 18M2 chip to replace the Arduino board and sensor board. Keep the Arduino and sensor board for another time! 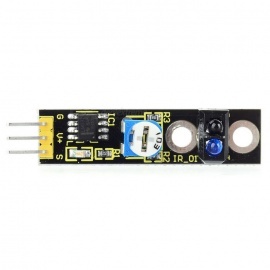 Add a bluetooth module (see further below) for just US$4 and you have your own OP1 robot! Electroflash link Electroflash has breadboards (just push in components, no soldering) and programme download cables at good prices too. Picaxe chips (try the 08M2, 14M2 or 18M2) are VERY easy to programme in BASIC with free software, much simpler than the Arduino. 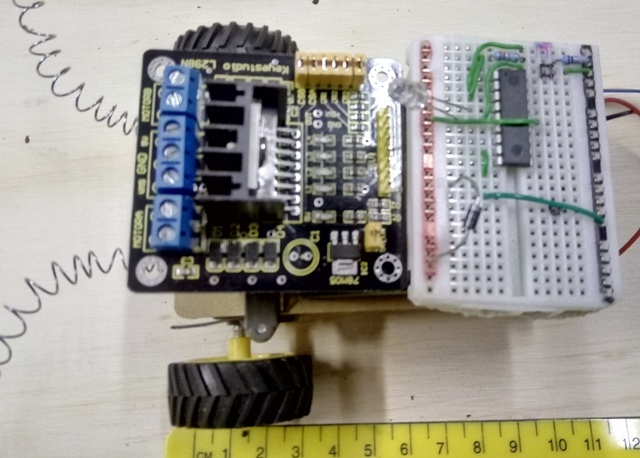 Micro:bit robots also need the Micro:bit controller as well (link here) Easy to programme using free software. This is a line follower. Mounted on MDF board cut to size. 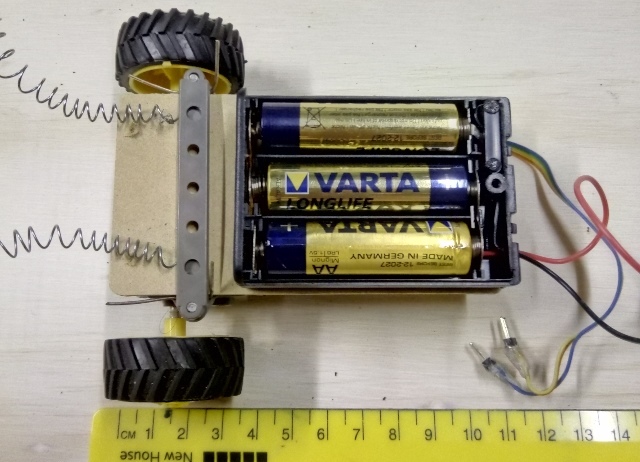 Your robot could use just two AA cells for a lighter weight battery pack running at 3 volts. I place the pack on the MDF, then attached the 'brains' of the robot, the PICAXE breadboard, on top. A little hot glue can help hold things together if just solving a maze. 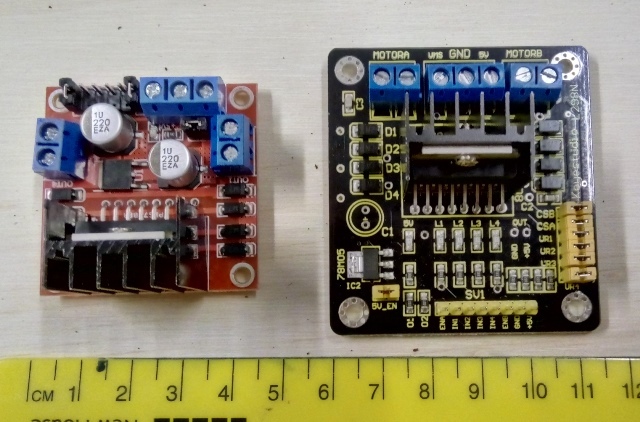 Using 3V or 4.5V depends on the motors you are using. You can use an 08M2 chip or 14M2 chip to drive the motors via transistors - PICAXE, breadboard, cable link. I use the USB adapter and serial cable for programming. 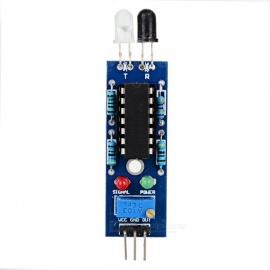 I prefer to use one of the motor drive controller boards below; very cheap, reliable and simple to control. I have provided a test code below for you to learn from. L239N motor controller board. This sits on top of the battery pack, breadboard nearby for connection of signal wires. Consider an extra battery pack to power the motors seperately from the PICAXE, definately for the larger MegaBot sumo robots. 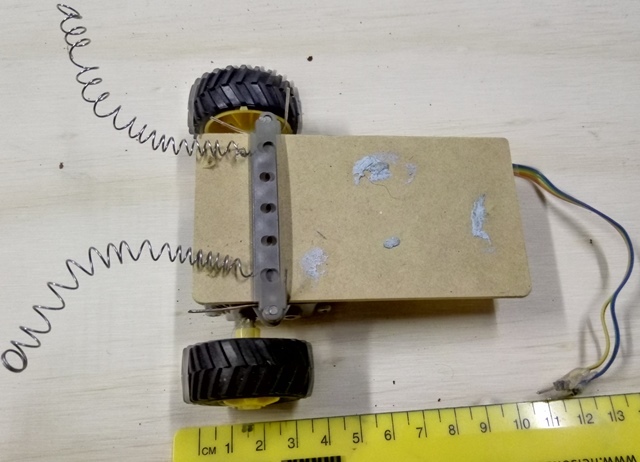 See further below for a H-bridge circuit from Andrew Hornblow for a simple maze robot without the motor controller. 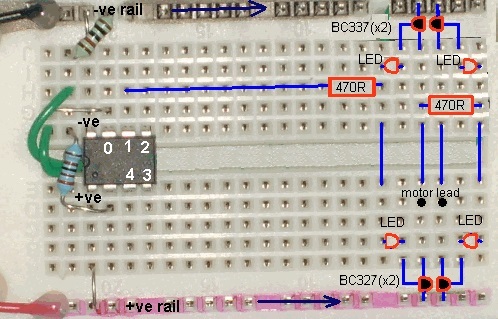 H-bridge using transistors and blue and green LEDs. H-bridge circuit from Andrew Hornblow. This uses high frequency sound, like echo location used by bats, to sense how far away an object is. Get 2 of these and position a distance apart slightly more than the thickness of the line being followed. You can drag and drop your own buttons, joystick, graphs and meters to make a custom display screen for your awesome robot! Lesson plans link for coding in EdBlocks, Edware, or EdPy. I have deliberately made the code in long form for novice or beginner students to read. How could you rewrite the code to be shorter and more efficient? PICAXE 08M-based Casio Graphics Calculator controlled robot, CASI is part of the RIGEL project, used in my Calculus and Physics classes. Find out more about building a PICAXE games app link and home-made science and maths equipment here for student-led problem-based learning in STEM. With a slight modifiction (removing back and front rubber bumpers), Cybot is a good example of design and 'dressing up' the bare mechanics to make a more pleasant looking robot. Also order two line sensors if you want to have a line follower. Add a body shell and face to complete it! Also order the Mico:bit controller itself, and two line sensors if you want to have a line follower. Add a body shell and face to complete it! With a slight modification (reposition the wheels to underneath the body) OP1 is a MegaBot, a good example of recycling to make a robot. 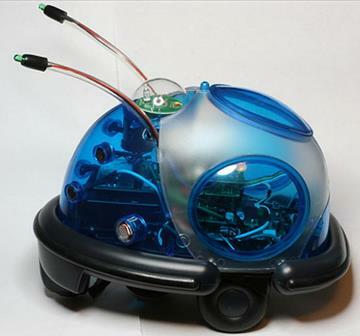 The body shell is from an old TV / radio and hides the circuitry of a modified two wheeled smart car (above). 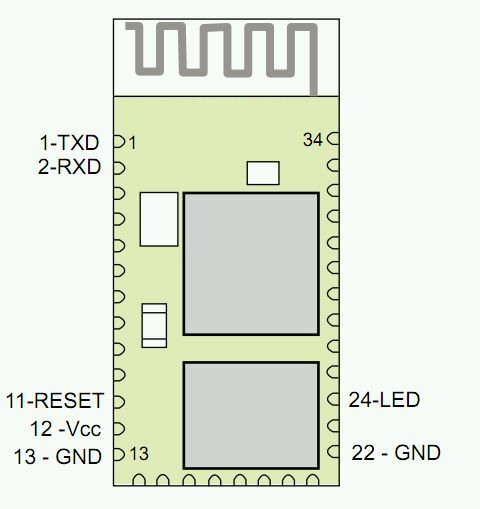 I used a PICAXE chip to replace the Arduino board. Add a MP3 player module for sound effects. Full-size replica..too big for competitions but a very nice STEM project to build! Arduino or PICAXE controlled. Students can sit inside and operate the Dalek. Runs on 6 C-size cells. Dome lights flash in time with voice modulator, gun fires with sound effect. Want to gain more digital technology skills? Make a movie using your robots! See the Dalek battle a bear in our 48 hour film entry "Collision course" by Jampot Productions in Taranaki, winner of two local awards including Audience Favourite.